Western Hemisphere / North and South America. 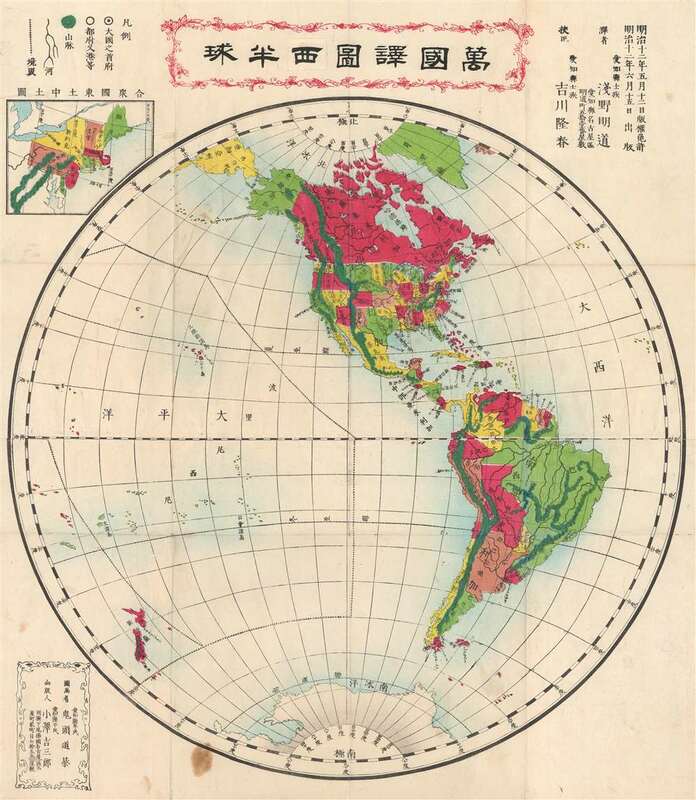 This is a rare Japanese folding map of the Western Hemisphere dated June 15, 1879 or Meiji 12. Depicts North America and South America on a hemispherical projection. Shows parts of Antarctica, New Zealand, Greenland, and Siberia. Most of the individual U.S. States and territories are labeled and color coded based upon a configuration prevalent in 1860. Shows a large Nebraska territory extending north as far as Canada. Colorado is present and Oregon and Washington extend eastward as far as the Rocky Mountains. Shows the Rocky Mountain range, the Andes, and other mountain ranges with green color. Notes Hawaii. An inset of the New England states appears in the upper left quadrant. Folds into its original yellow boards. It is extremely rare to find a Japanese map of America from this period. This is the only example we have found. Very good condition. Original fold lines. Minor discoloration in the lower left quadrant. Attached to original yellow paper boards.